Inspired by Japanese paper-folding, Canary Wharf booths make a sculptural statement whether open or shut. 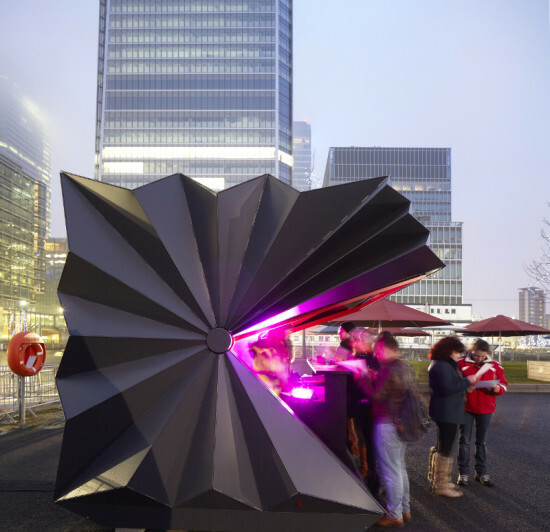 Make Architects’ folding kiosks for Canary Wharf in London bring new meaning to the term “pop-up shop.” The bellows-like structures were inspired by Japanese paper folding. 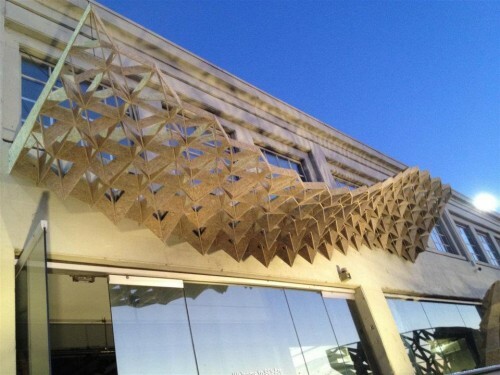 “[The kiosk] had to be solid, but lightweight, so then that led us to origami,” said Make lead project architect Sean Affleck. “[You] end up with something very flimsy; add a few folds and creases, and suddenly the strength appears. In the folds, the shape appears.” In addition to adding strength, the folds accomplish an important element of the kiosk program. The public officials who commissioned the design wanted the booths to be aesthetically pleasing whether open or shut. “What we didn’t want was to create a box that obviously had a shutter or door,” said Affleck. “We wanted to disguise the door—you weren’t quite sure which part of it was going to open.” When closed, the booths appear as futuristic sculptures, their matte grey exteriors evoking the steel and stone of the city. During operation, the upper folds compress to reveal a simple, customizable interior accented with reddish-orange strips of metal. 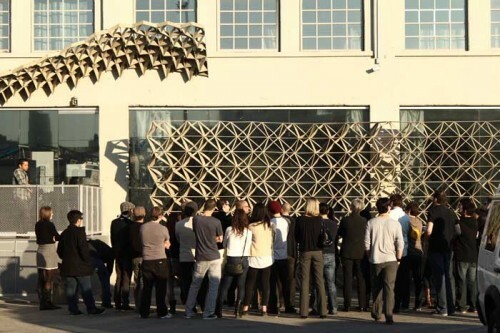 For the last several years, SCI-Arc's Studio 1A has given new students the chance to literally make their mark by producing projects that become permanent fixtures at the school. On Friday, this year's class revealed a project that started as a piece of clothing, then became a wire model, then became a mockup, and finally ended as a new undulating and faceted canopy and wall. Made of a recycled carbon fiber called Nyloboard, the project's more than 2,000 pieces were all hand cut and, somehow, none are exactly alike. They're attached with Gorilla Glue, nails, and screws. 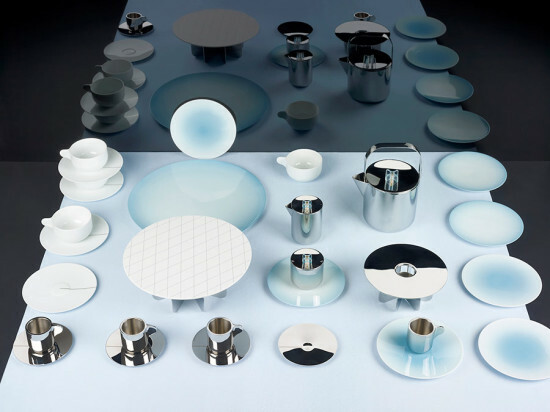 "It's something that exists at the scale of the world, which can take years for an architect," said Nathan Bishop, who along with Jackilin Hah Bloom and Jenny Wu led the studio.